Proprietary Name: Modafinil What is the Proprietary Name? Non-Proprietary Name: Modafinil What is the Non-Proprietary Name? Modafinil with NDC 72578-006 is a a human prescription drug product labeled by Viona Pharmaceuticals Inc. The generic name of Modafinil is modafinil. The product's dosage form is tablet and is administered via oral form. FDA Application Number: ANDA209966 What is the FDA Application Number? Start Marketing Date: 02-15-2019 What is the Start Marketing Date? Modafinil tablets are indicated to improve wakefulness in adult patients with excessive sleepiness associated with narcolepsy, obstructive sleep apnea (OSA), or shift work disorder (SWD). Limitations of Use In OSA, modafinil is indicated to treat excessive sleepiness and not as treatment for the underlying obstruction. If continuous positive airway pressure (CPAP) is the treatment of choice for a patient, a maximal effort to treat with CPAP for an adequate period of time should be made prior to initiating and during treatment with modafinil for excessive sleepiness. The recommended dosage of modafinil for patients with narcolepsy or OSA is 200 mg taken orally once a day as a single dose in the morning. Doses up to 400 mg/day, given as a single dose, have been well tolerated, but there is no consistent evidence that this dose confers additional benefit beyond that of the 200 mg/day dose [see Clinical Pharmacology (12.3) and Clinical Studies (14.1, 14.2)]. The recommended dosage of modafinil for patients with SWD is 200 mg taken orally once a day as a single dose approximately 1-hour prior to the start of their work shift. In patients with severe hepatic impairment, the dosage of modafinil should be reduced to one-half of that recommended for patients with normal hepatic function [see Use in Specific Populations (8.6) and Clinical Pharmacology (12.3)]. 100 mg: white to off-white, capsule shaped uncoated tablets, debossed with "1072" on one side and plain on the other side.200 mg: white to off-white, capsule shaped uncoated scored tablet, debossed with "10" & "73" on either side of scoreline on one side and plain on other side. 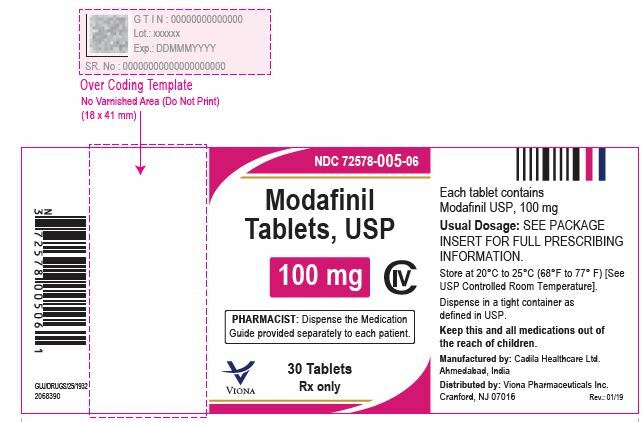 Modafinil is contraindicated in patients with known hypersensitivity to modafinil or armodafinil or its inactive ingredients [see Warnings and Precautions (5.1, 5.2, 5.3)]. Serious rash requiring hospitalization and discontinuation of treatment has been reported in association with the use of modafinil. In clinical trials of modafinil, the incidence of rash resulting in discontinuation was approximately 0.8% (13 per 1,585) in pediatric patients (age < 17-years); these rashes included 1 case of possible Stevens - Johnson syndrome (SJS) and 1 case of apparent multi-organ hypersensitivity reaction. Several of the cases were associated with fever and other abnormalities (e.g., vomiting, leukopenia). The median time to rash that resulted in discontinuation was 13-days. No such cases were observed among 380 pediatric patients who received placebo. Modafinil is not approved for use in pediatric patients for any indication [see Use in Specific Populations (8.4)]. Rare cases of serious or life-threatening rash, including SJS, Toxic Epidermal Necrolysis (TEN), and Drug Rash with Eosinophilia and Systemic Symptoms (DRESS) have been reported in adults and children in worldwide postmarketing experience. The reporting rate of TEN and SJS associated with modafinil use, which is generally accepted to be an underestimate due to underreporting, exceeds the background incidence rate. Estimates of the background incidence rate for these serious skin reactions in the general population range between 1 to 2 cases per million-person years. There are no factors that are known to predict the risk of occurrence or the severity of rash associated with modafinil. Nearly all cases of serious rash associated with modafinil occurred within 1-week to 5-weeks after treatment initiation. However, isolated cases have been reported after prolonged treatment (e.g., 3-months). Accordingly, duration of therapy cannot be relied upon as a means to predict the potential risk heralded by the first appearance of a rash. Although benign rashes also occur with modafinil, it is not possible to reliably predict which rashes will prove to be serious. Accordingly, modafinil should be discontinued at the first sign of rash, unless the rash is clearly not drug-related. Discontinuation of treatment may not prevent a rash from becoming life-threatening or permanently disabling or disfiguring. Angioedema and hypersensitivity (with rash, dysphagia, and bronchospasm), were observed in patients treated with armodafinil, the R enantiomer of modafinil (which is the racemic mixture). No such cases were observed in modafinil clinical trials. However, angioedema has been reported in postmarketing experience with modafinil. Patients should be advised to discontinue therapy and immediately report to their physician any signs or symptoms suggesting angioedema or anaphylaxis (e.g., swelling of face, eyes, lips, tongue or larynx; difficulty in swallowing or breathing; hoarseness). Multi-organ hypersensitivity reactions, including at least one fatality in postmarketing experience, have occurred in close temporal association (median time to detection 13-days: range 4 to 33) to the initiation of modafinil.Although there have been a limited number of reports, multi-organ hypersensitivity reactions may result in hospitalization or be life-threatening. There are no factors that are known to predict the risk of occurrence or the severity of multi-organ hypersensitivity reactions. Signs and symptoms of this disorder were diverse; however, patients typically, although not exclusively, presented with fever and rash associated with other organ system involvement. Other associated manifestations included myocarditis, hepatitis, liver function test abnormalities, hematological abnormalities (e.g., eosinophilia, leukopenia, thrombocytopenia), pruritus, and asthenia. Because multi-organ hypersensitivity is variable in its expression, other organ system symptoms and signs, not noted here, may occur. If a multi-organ hypersensitivity reaction is suspected, modafinil should be discontinued. Although there are no case reports to indicate cross-sensitivity with other drugs that produce this syndrome, the experience with drugs associated with multi-organ hypersensitivity would indicate this to be a possibility. Patients with abnormal levels of sleepiness who take modafinil should be advised that their level of wakefulness may not return to normal. Patients with excessive sleepiness, including those taking modafinil, should be frequently reassessed for their degree of sleepiness and, if appropriate, advised to avoid driving or any other potentially dangerous activity. Prescribers should also be aware that patients may not acknowledge sleepiness or drowsiness until directly questioned about drowsiness or sleepiness during specific activities. Psychiatric adverse reactions have been reported in patients treated with modafinil. In the adult modafinil controlled trials, psychiatric symptoms resulting in treatment discontinuation (at a frequency ≥ 0.3%) and reported more often in patients treated with modafinil compared to those treated with placebo were anxiety (1%), nervousness (1%), insomnia (< 1%), confusion (< 1%), agitation (< 1%), and depression (< 1%).Postmarketing adverse reactions associated with the use of modafinil have included mania, delusions, hallucinations, suicidal ideation, and aggression, some resulting in hospitalization. Many, but not all, patients had a prior psychiatric history. One healthy male volunteer developed ideas of reference, paranoid delusions, and auditory hallucinations in association with multiple daily 600 mg doses of modafinil (three times the recommended dose) and sleep deprivation. There was no evidence of psychosis 36-hours after drug discontinuation. Caution should be exercised when modafinil is given to patients with a history of psychosis, depression, or mania. Consideration should be given to the possible emergence or exacerbation of psychiatric symptoms in patients treated with modafinil. If psychiatric symptoms develop in association with modafinil administration, consider discontinuing modafinil. Although modafinil has not been shown to produce functional impairment, any drug affecting the CNS may alter judgment, thinking or motor skills. Patients should be cautioned about operating automobile or other hazardous machinery until it is reasonably certain that modafinil therapy will not adversely affect their ability to engage in such activities. In modafinil clinical studies, cardiovascular adverse reactions, including chest pain, palpitations, dyspnea, and transient ischemic T-wave changes on ECG occurred in three subjects in association with mitral valve prolapse or left ventricular hypertrophy. In a Canadian clinical trial, a 35-year old obese narcoleptic male with a prior history of syncopal episodes experienced a 9-second episode of asystole after 27-days of modafinil treatment (300 mg/day in divided doses). Modafinil is not recommended in patients with a history of left ventricular hypertrophy or in patients with mitral valve prolapse who have experienced the mitral valve prolapse syndrome when previously receiving CNS stimulants. Findings suggestive of mitral valve prolapse syndrome include but are not limited to ischemic ECG changes, chest pain, or arrhythmia. If new onset of any of these findings occurs, consider cardiac evaluation. Consider increased monitoring in patients with a recent history of myocardial infarction or unstable angina. Blood pressure monitoring in short term (≤ 3-months) controlled trials showed no clinically significant changes in mean systolic and diastolic blood pressure in patients receiving modafinil as compared to placebo. However, a retrospective analysis of the use of antihypertensive medication in these studies showed that a greater proportion of patients on modafinil required new or increased use of antihypertensive medications (2.4%) compared to patients on placebo (0.7%). The differential use was slightly larger when only studies in OSA were included, with 3.4% of patients on modafinil and 1.1% of patients on placebo requiring such alterations in the use of antihypertensive medication. Increased monitoring of heart rate and blood pressure may be appropriate in patients on modafinil. Caution should be exercised when prescribing modafinil to patients with known cardiovascular disease. Because clinical trials are conducted under widely varying conditions, adverse reaction rates observed in the clinical trials of a drug cannot be directly compared to rates in the clinical trials of another drug and may not reflect the rates observed in practice. Modafinil has been evaluated for safety in over 3,500 patients, of whom more than 2,000 patients with excessive sleepiness associated with OSA, SWD, and narcolepsy. Most Common Adverse Reactions In placebo-controlled clinical trials, the most common adverse reactions (≥ 5%) associated with the use of modafinil more frequently than placebo-treated patients were headache, nausea, nervousness, rhinitis, diarrhea, back pain, anxiety, insomnia, dizziness, and dyspepsia. The adverse reaction profile was similar across these studies.Table 1 presents the adverse reactions that occurred at a rate of 1% or more and were more frequent in modafinil-treated patients than in placebo-treated patients in the placebo-controlled clinical trials. Table 1 Adverse Reactions in Pooled Placebo-Controlled Trials* in Narcolepsy, OSA, and SWD Modafinil (%) (n = 934) Placebo (%) (n = 567) Headache 34 23 Nausea 11 3 Nervousness 7 3 Rhinitis 7 6 Back Pain 6 5 Diarrhea 6 5 Anxiety 5 1 Dizziness 5 4 Dyspepsia 5 4 Insomnia 5 1 Anorexia 4 1 Dry Mouth 4 2 Pharyngitis 4 2 Chest Pain 3 1 Hypertension 3 1 Abnormal Liver Function 2 1 Constipation 2 1 Depression 2 1 Palpitation 2 1 Paresthesia 2 0 Somnolence 2 1 Tachycardia 2 1 Vasodilatation 2 0 Abnormal Vision 1 0 Agitation 1 0 Asthma 1 0 Chills 1 0 Confusion 1 0 Dyskinesia 1 0 Edema 1 0 Emotional Lability 1 0 Eosinophilia 1 0 Epistaxis 1 0 Flatulence 1 0 Hyperkinesia 1 0 Hypertonia 1 0 Mouth Ulceration 1 0 Sweating 1 0 Taste Perversion 1 0 Thirst 1 0 Tremor 1 0 Urine Abnormality 1 0 Vertigo 1 0Dose-Dependent Adverse ReactionsIn the placebo-controlled clinical trials which compared doses of 200 mg/day, 300 mg/day, and 400 mg/day of modafinil and placebo, the following adverse reactions were dose related: headache and anxiety.Adverse Reactions Resulting in Discontinuation of TreatmentIn placebo-controlled clinical trials, 74 of the 934 patients (8%) who received modafinil discontinued due to an adverse reaction compared to 3% of patients that received placebo. The most frequent reasons for discontinuation that occurred at a higher rate for modafinil than placebo patients were headache (2%), nausea, anxiety, dizziness, insomnia, chest pain, and nervousness (each < 1%). Laboratory AbnormalitiesClinical chemistry, hematology, and urinalysis parameters were monitored in the studies. Mean plasma levels of gamma glutamyltransferase (GGT) and alkaline phosphatase (AP) were found to be higher following administration of modafinil, but not placebo. Few patients, however, had GGT or AP elevations outside of the normal range. Shifts to higher, but not clinically significantly abnormal, GGT and AP values appeared to increase with time in the population treated with modafinil in the placebo-controlled clinical trials. No differences were apparent in alanine aminotransferase (ALT), aspartate aminotransferase (AST), total protein, albumin, or total bilirubin. Effects of Modafinil on CYP3A4/5 Substrates The clearance of drugs that are substrates for CYP3A4/5 (e.g., steroidal contraceptives, cyclosporine, midazolam, and triazolam) may be increased by modafinil via induction of metabolic enzymes, which results in lower systemic exposure. Dosage adjustment of these drugs should be considered when these drugs are used concomitantly with modafinil [see Clinical Pharmacology (12.3)]. The effectiveness of steroidal contraceptives may be reduced when used with modafinil and for one month after discontinuation of therapy. Alternative or concomitant methods of contraception are recommended for patients taking steroidal contraceptives (e.g., ethinyl estradiol) when treated concomitantly with modafinil and for one month after discontinuation of modafinil treatment.Blood levels of cyclosporine may be reduced when used with modafinil. Monitoring of circulating cyclosporine concentrations and appropriate dosage adjustment for cyclosporine should be considered when used concomitantly with modafinil. Effects of Modafinil on CYP2C19 Substrates Elimination of drugs that are substrates for CYP2C19 (e.g., phenytoin, diazepam, propranolol, omeprazole, and clomipramine) may be prolonged by modafinil via inhibition of metabolic enzymes, with resultant higher systemic exposure. In individuals deficient in the CYP2D6 enzyme, the levels of CYP2D6 substrates which have ancillary routes of elimination through CYP2C19, such as tricyclic antidepressants and selective serotonin reuptake inhibitors, may be increased by co-administration of modafinil. Dose adjustments of these drugs and other drugs that are substrates for CYP2C19 may be necessary when used concomitantly with modafinil [see Clinical Pharmacology (12.3)]. Warfarin More frequent monitoring of prothrombin times/INR should be considered whenever modafinil is co-administered with warfarin [see Clinical Pharmacology (12.3)]. Monoamine Oxidase (MAO) Inhibitors Caution should be used when concomitantly administering MAO inhibitors and modafinil. Pregnancy Category C There are no adequate and well-controlled studies of modafinil in pregnant women. Intrauterine growth restriction and spontaneous abortion have been reported in association with modafinil (a mixture of R-and S-modafinil) and armodafinil (the R-enantiomer of modafinil). Although the pharmacology of modafinil is not identical to that of the sympathomimetic amines, it does share some pharmacologic properties with this class. Certain of these drugs have been associated with intrauterine growth restriction and spontaneous abortions. Whether the cases reported with modafinil are drug-related is unknown. In studies of modafinil and armodafinil conducted in rats (modafinil, armodafinil) and rabbits (modafinil), developmental toxicity was observed at clinically relevant plasma exposures. Modafinil should be used during pregnancy only if the potential benefit justifies the potential risk to the fetus.Modafinil (50 mg/kg/day, 100 mg/kg/day, or 200 mg/kg/day) administered orally to pregnant rats throughout organogenesis caused, in the absence of maternal toxicity, an increase in resorptions and an increased incidence of visceral and skeletal variations in the offspring at the highest dose tested. The higher no-effect dose for embryofetal developmental toxicity in rats (100 mg/kg/day) was associated with a plasma modafinil AUC less than that in humans at the recommended human dose (RHD) of modafinil (200 mg/day). However, in a subsequent study of up to 480 mg/kg/day of modafinil, no adverse effects on embryofetal development were observed. Oral administration of armodafinil (60 mg/kg/day, 200 mg/kg/day, or 600 mg/kg/day) to pregnant rats throughout organogenesis resulted in increased incidences of fetal visceral and skeletal variations and decreased fetal body weight at the highest dose tested. The highest no-effect dose for embryofetal developmental toxicity in rats (200 mg/kg/day) was associated with a plasma armodafinil AUC less than that in humans at the RHD of modafinil. Modafinil administered orally to pregnant rabbits throughout organogenesis at doses of up to 100 mg/kg/day had no effect on embryofetal development; however, the doses used were too low to adequately assess the effects of modafinil on embryofetal development. In a subsequent developmental toxicity study evaluating doses of 45 mg/kg/day, 90 mg/kg/day, and 180 mg/kg/day in pregnant rabbits, the incidences of fetal structural alterations and embryofetal death were increased at the highest dose. The highest no-effect dose for developmental toxicity (100 mg/kg/day) was associated with a plasma modafinil AUC similar to that in humans at the RHD of modafinil. Modafinil administration to rats throughout gestation and lactation at oral doses of up to 200 mg/kg/day resulted in decreased viability in the offspring at doses greater than 20 mg/kg/day, a dose resulting in a plasma modafinil AUC less than that in humans at the RHD of modafinil. No effects on postnatal developmental and neurobehavioral parameters were observed in surviving offspring. Pregnancy Registry A pregnancy registry has been established to collect information on the pregnancy outcomes of women exposed to modafinil. Healthcare providers are encouraged to register pregnant patients, or pregnant women may enroll themselves in the registry by calling 1-866-404-4106 (toll free). It is not known whether modafinil or its metabolites are excreted in human milk. Because many drugs are excreted in human milk, caution should be exercised when modafinil is administered to a nursing woman. Safety and effectiveness in pediatric patients have not been established. Modafinil is not approved in this population for any indication. Serious skin rashes, including erythema multiforme major (EMM) and Stevens-Johnson Syndrome (SJS) have been associated with modafinil use in pediatric patients [see Warnings and Precautions (5.1)]. In a controlled 6-week study, 165 pediatric patients (aged 5-years to 17-years) with narcolepsy were treated with modafinil (n=123), or placebo (n=42). There were no statistically significant differences favoring modafinil over placebo in prolonging sleep latency as measured by MSLT, or in perceptions of sleepiness as determined by the clinical global impression-clinician scale (CGI-C). In the controlled and open-label clinical studies, treatment emergent adverse reactions of the psychiatric and nervous system included Tourette's syndrome, insomnia, hostility, increased cataplexy, increased hypnagogic hallucinations, and suicidal ideation. Transient leukopenia, which resolved without medical intervention, was also observed. In the controlled clinical study, 3 of 38 girls, ages 12 or older, treated with modafinil experienced dysmenorrhea compared to 0 of 10 girls who received placebo. There were three 7-week to 9-week, double-blind, placebo-controlled, parallel group studies in children and adolescents (aged 6-years to 17-years) with Attention-Deficit Hyperactivity Disorder (ADHD). Two of the studies were flexible-dose studies (up to 425 mg/day), and the third was a fixed-dose study (340 mg/day for patients < 30 kg and 425 mg/day for patients ≥ 30 kg). Although these studies showed statistically significant differences favoring modafinil over placebo in reducing ADHD symptoms as measured by the ADHD-RS (school version), there were 3 cases of serious rash including one case of possible SJS among 933 patients exposed to modafinil in this program. Modafinil is not approved for use in treating ADHD. In clinical trials, experience in a limited number of modafinil-treated patients who were greater than 65-years of age showed an incidence of adverse reactions similar to other age groups. In elderly patients, elimination of modafinil and its metabolites may be reduced as a consequence of aging. Therefore, consideration should be given to the use of lower doses and close monitoring in this population [see Dosage and Administration (2.4) and Clinical Pharmacology (12.3)]. In patients with severe hepatic impairment, the dose of modafinil should be reduced to one-half of that recommended for patients with normal hepatic function [see Dosage and Administration (2.3) and Clinical Pharmacology (12.3)]. Modafinil contains modafinil, a Schedule IV controlled substance. In humans, modafinil produces psychoactive and euphoric effects, alterations in mood, perception, thinking, and feelings typical of other CNS stimulants. In in vitro binding studies, modafinil binds to the dopamine reuptake site and causes an increase in extracellular dopamine, but no increase in dopamine release. Modafinil is reinforcing, as evidenced by its self-administration in monkeys previously trained to self-administer cocaine. In some studies, modafinil was also partially discriminated as stimulant-like. Physicians should follow patients closely, especially those with a history of drug and/or stimulant (e.g., methylphenidate, amphetamine, or cocaine) abuse. Patients should be observed for signs of misuse or abuse (e.g., incrementation of doses or drug-seeking behavior). The abuse potential of modafinil (200 mg, 400 mg, and 800 mg) was assessed relative to methylphenidate (45 mg and 90 mg) in an inpatient study in individuals experienced with drugs of abuse. Results from this clinical study demonstrated that modafinil produced psychoactive and euphoric effects and feelings consistent with other scheduled CNS stimulants (methylphenidate). In one placebo-controlled clinical trial, the effects of modafinil withdrawal were monitored following 9-weeks of modafinil use. There were no reported withdrawal symptoms with modafinil during 14-days of observation, although sleepiness returned in narcoleptic patients. In clinical trials, a total of 151 protocol-specified doses ranging from 1,000 mg/day to 1,600 mg/day (5-times to 8-times the recommended daily dose of modafinil) have been administered to 32 subjects, including 13 subjects who received doses of 1,000 mg/day or 1,200 mg/day for 7 to 21 consecutive days. In addition, several intentional acute overdoses occurred; the two largest being 4,500 mg and 4,000 mg taken by two subjects participating in foreign depression studies. None of these study subjects experienced any unexpected or life-threatening effects. Adverse reactions that were reported at these doses included excitation or agitation, insomnia, and slight or moderate elevations in hemodynamic parameters. Other observed high-dose effects in clinical studies have included anxiety, irritability, aggressiveness, confusion, nervousness, tremor, palpitations, sleep disturbances, nausea, diarrhea, and decreased prothrombin time. From postmarketing experience, there have been reports of fatal overdoses involving modafinil alone or in combination with other drugs. Symptoms most often accompanying modafinil overdose, alone or in combination with other drugs have included insomnia; central nervous system symptoms such as restlessness, disorientation, confusion, agitation, anxiety, excitation, and hallucination; digestive changes such as nausea and diarrhea; and cardiovascular changes such as tachycardia, bradycardia, hypertension, and chest pain. Cases of accidental ingestion/overdose have been reported in children as young as 11-months of age. The highest reported accidental ingestion on a mg/kg basis occurred in a three-year-old boy who ingested 800 mg to 1,000 mg (50 mg/kg to 63 mg/kg) of modafinil. The child remained stable. The symptoms associated with overdose in children were similar to those observed in adults.No specific antidote exists for the toxic effects of a modafinil overdose. Such overdoses should be managed with primarily supportive care, including cardiovascular monitoring. Modafinil is a wakefulness-promoting agent for oral administration. Modafinil is a racemic compound. The chemical name for modafinil is 2-[(diphenylmethyl)sulfinyl]acetamide. The molecular formula is C15H15NO2S and the molecular weight is 273.35. The chemical structure is:Modafinil, USP is a white to almost white, crystalline powder that is practically insoluble in water and cyclohexane. It is sparingly to slightly soluble in methanol and acetone. Modafinil tablets, USP contain 100 mg or 200 mg of modafinil, USP and the following inactive ingredients: croscarmellose sodium, lactose monohydrate, magnesium stearate, microcrystalline cellulose, povidone, and pregelatinized starch. Product complies with USP dissolution test 2. The mechanism(s) through which modafinil promotes wakefulness is unknown. Modafinil has wake-promoting actions similar to sympathomimetic agents including amphetamine and methylphenidate, although the pharmacologic profile is not identical to that of the sympathomimetic amines. Modafinil-induced wakefulness can be attenuated by the α1-adrenergic receptor antagonist, prazosin; however, modafinil is inactive in other in vitro assay systems known to be responsive to α-adrenergic agonists such as the rat vas deferens preparation. Modafinil is not a direct-or indirect-acting dopamine receptor agonist. However, in vitro, modafinil binds to the dopamine transporter and inhibits dopamine reuptake. This activity has been associated in vivo with increased extracellular dopamine levels in some brain regions of animals. In genetically engineered mice lacking the dopamine transporter (DAT), modafinil lacked wake-promoting activity, suggesting that this activity was DAT-dependent. However, the wake-promoting effects of modafinil, unlike those of amphetamine, were not antagonized by the dopamine receptor antagonist haloperidol in rats. In addition, alpha-methyl-p-tyrosine, a dopamine synthesis inhibitor, blocks the action of amphetamine, but does not block locomotor activity induced by modafinil.In the cat, equal wakefulness-promoting doses of methylphenidate and amphetamine increased neuronal activation throughout the brain. Modafinil at an equivalent wakefulness-promoting dose selectively and prominently increased neuronal activation in more discrete regions of the brain. The relationship of this finding in cats to the effects of modafinil in humans is unknown. In addition to its wake-promoting effects and ability to increase locomotor activity in animals, modafinil produces psychoactive and euphoric effects, alterations in mood, perception, thinking, and feelings typical of other CNS stimulants in humans. Modafinil has reinforcing properties, as evidenced by its self-administration in monkeys previously trained to self-administer cocaine; modafinil was also partially discriminated as stimulant-like. The optical enantiomers of modafinil have similar pharmacological actions in animals. Two major metabolites of modafinil, modafinil acid and modafinil sulfone, do not appear to contribute to the CNS-activating properties of modafinil. Modafinil is a 1:1 racemic compound, whose enantiomers have different pharmacokinetics (e.g., the half-life of R-modafinil is approximately three times that of S-modafinil in adult humans). The enantiomers do not interconvert. At steady state, total exposure to R-modafinil is approximately three times that for S-modafinil. The trough concentration (Cmin,ss) of circulating modafinil after once daily dosing consists of 90% of R-modafinil and 10% of S-modafinil. The effective elimination half-life of modafinil after multiple doses is about 15-hours. The enantiomers of modafinil exhibit linear kinetics upon multiple dosing of 200 mg/day to 600 mg/day once daily in healthy volunteers. Apparent steady states of total modafinil and R-modafinil are reached after 2-days to 4-days of dosing.Absorption Modafinil is readily absorbed after oral administration, with peak plasma concentrations occurring at 2-hours to 4-hours. The bioavailability of modafinil tablets is approximately equal to that of an aqueous suspension. The absolute oral bioavailability was not determined due to the aqueous insolubility (< 1 mg/mL) of modafinil, which precluded intravenous administration. Food has no effect on overall modafinil bioavailability; however, time to reach peak concentration (tmax) may be delayed by approximately one hour if taken with food.Distribution Modafinil has an apparent volume of distribution of approximately 0.9 L/kg. In human plasma, in vitro, modafinil is moderately bound to plasma protein (approximately 60%), mainly to albumin. The potential for interactions of modafinil with highly protein-bound drugs is considered to be minimal. Metabolism and Elimination The major route of elimination is metabolism (approximately 90%), primarily by the liver, with subsequent renal elimination of the metabolites. Urine alkalinization has no effect on the elimination of modafinil. Metabolism occurs through hydrolytic deamidation, S-oxidation, aromatic ring hydroxylation, and glucuronide conjugation. Less than 10% of an administered dose is excreted as the parent compound. In a clinical study using radiolabeled modafinil, a total of 81% of the administered radioactivity was recovered in 11-days post-dose, predominantly in the urine (80% vs. 1% in the feces). The largest fraction of the drug in urine was modafinil acid, but at least six other metabolites were present in lower concentrations. Only two metabolites reach appreciable concentrations in plasma, i.e., modafinil acid and modafinil sulfone. In preclinical models, modafinil acid, modafinil sulfone, 2-[(diphenylmethyl)sulfonyl]acetic acid and 4-hydroxy modafinil, were inactive or did not appear to mediate the arousal effects of modafinil. In adults, decreases in trough levels of modafinil have sometimes been observed after multiple weeks of dosing, suggesting auto-induction, but the magnitude of the decreases and the inconsistency of their occurrence suggest that their clinical significance is minimal. Significant accumulation of modafinil sulfone has been observed after multiple doses due to its long elimination half-life of 40-hours. Auto-induction of metabolizing enzymes, most importantly cytochrome P-450 CYP3A4, has also been observed in vitro after incubation of primary cultures of human hepatocytes with modafinil and in vivo after extended administration of modafinil at 400 mg/day.Specific Populations Age A slight decrease (approximately 20%) in the oral clearance (CL/F) of modafinil was observed in a single dose study at 200 mg in 12 subjects with a mean age of 63-years (range 53-years to 72-years), but the change was considered not likely to be clinically significant. In a multiple dose study (300 mg/day) in 12 patients with a mean age of 82-years (range 67-years to 87-years), the mean levels of modafinil in plasma were approximately two times those historically obtained in matched younger subjects. Due to potential effects from the multiple concomitant medications with which most of the patients were being treated, the apparent difference in modafinil pharmacokinetics may not be attributable solely to the effects of aging. However, the results suggest that the clearance of modafinil may be reduced in the elderly [see Dosage and Administration (2.4) and Use in Specific Populations (8.5)]. Gender The pharmacokinetics of modafinil are not affected by gender. Race The influence of race on the pharmacokinetics of modafinil has not been studied. Renal Impairment In a single dose 200 mg modafinil study, severe chronic renal failure (creatinine clearance ≤ 20 mL/min) did not significantly influence the pharmacokinetics of modafinil, but exposure to modafinil acid (an inactive metabolite) was increased 9-fold. Hepatic Impairment The pharmacokinetics and metabolism of modafinil were examined in patients with cirrhosis of the liver (6 men and 3 women). Three patients had stage B or B+ cirrhosis and 6 patients had stage C or C+ cirrhosis (per the Child-Pugh score criteria). Clinically 8 patients of 9 patients were icteric and all had ascites. In these patients, the oral clearance of modafinil was decreased by about 60% and the steady state concentration was doubled compared to normal patients [see Dosage and Administration (2.3) and Use in Specific Populations (8.6)]. Drug InteractionsIn vitro data demonstrated that modafinil weakly induces CYP1A2, CYP2B6, and possibly CYP3A activities in a concentration-related manner and that CYP2C19 activity is reversibly inhibited by modafinil. In vitro data also demonstrated that modafinil produced an apparent concentration-related suppression of expression of CYP2C9 activity. Other CYP activities did not appear to be affected by modafinil. Potential Interactions with Drugs That Inhibit, Induce, or Are Metabolized by Cytochrome P450 Isoenzymes and Other Hepatic EnzymesThe existence of multiple pathways for modafinil metabolism, as well as the fact that a non-CYP-related pathway is the most rapid in metabolizing modafinil, suggest that there is a low probability of substantive effects on the overall pharmacokinetic profile of modafinil due to CYP inhibition by concomitant medications. However, due to the partial involvement of CYP3A enzymes in the metabolic elimination of modafinil, co-administration of potent inducers of CYP3A4/5 (e.g., carbamazepine, phenobarbital, rifampin) or inhibitors of CYP3A4/5 (e.g., ketoconazole, erythromycin) could alter the plasma concentrations of modafinil. The Potential of modafinil to Alter the Metabolism of Other Drugs by Enzyme Induction or Inhibition Drugs Metabolized by CYP3A4/5In vitro data demonstrated that modafinil is a weak inducer of CYP3A activity in a concentration-related manner. Therefore, the blood levels and effectiveness of drugs that are substrates for CYP3A enzymes (e.g., steroidal contraceptives, cyclosporine, midazolam, and triazolam) may be reduced after initiation of concomitant treatment with modafinil [see Drug Interactions (7)] .Ethinyl Estradiol - Administration of modafinil to female volunteers once daily at 200 mg/day for 7-days followed by 400 mg/day for 21-days resulted in a mean 11% decrease in mean Cmax and 18% decrease in mean AUC0-24 of ethinyl estradiol (EE2; 0.035 mg; administered orally with norgestimate). There was no apparent change in the elimination rate of ethinyl estradiol.Triazolam - In the drug interaction study between modafinil and ethinyl estradiol (EE2), on the same days as those for the plasma sampling for EE2 pharmacokinetics, a single dose of triazolam (0.125 mg) was also administered. Mean Cmax and AUC0-∞ of triazolam were decreased by 42% and 59%, respectively, and its elimination half-life was decreased by approximately an hour after the modafinil treatment.Cyclosporine - One case of an interaction between modafinil and cyclosporine, a substrate of CYP3A4, has been reported in a 41-year old woman who had undergone an organ transplant. After one month of administration of 200 mg/day of modafinil, cyclosporine blood levels were decreased by 50%. The interaction was postulated to be due to the increased metabolism of cyclosporine, since no other factor expected to affect the disposition of the drug had changed.Midazolam - In a clinical study, concomitant administration of armodafinil 250 mg resulted in a reduction in systemic exposure to midazolam by 32% after a single oral dose (5 mg) and 17% after a single intravenous dose (2 mg).Quetiapine - In a separate clinical study, concomitant administration of armodafinil 250 mg with quetiapine (300 mg to 600 mg daily doses) resulted in a reduction in the mean systemic exposure of quetiapine by approximately 29%.Drugs Metabolized by CYP1A2 In vitro data demonstrated that modafinil is a weak inducer of CYP1A2 in a concentration-related manner. However, in a clinical study with armodafinil using caffeine as a probe substrate, no significant effect on CYP1A2 activity was observed.Drugs Metabolized by CYP2B6 In vitro data demonstrated that modafinil is a weak inducer of CYP2B6 activity in a concentration-related manner.Drugs Metabolized by CYP2C9In vitro data demonstrated that modafinil produced an apparent concentration-related suppression of expression of CYP2C9 activity suggesting that there is a potential for a metabolic interaction between modafinil and the substrates of this enzyme (e.g., S-warfarin and phenytoin) [see Drug Interactions (7)] .Warfarin: Concomitant administration of modafinil with warfarin did not produce significant changes in the pharmacokinetic profiles of R-and S-warfarin. However, since only a single dose of warfarin was tested in this study, an interaction cannot be ruled out [see Drug Interactions (7)] .Drugs Metabolized by CYP2C19 In vitro data demonstrated that modafinil is a reversible inhibitor of CYP2C19 activity. CYP2C19 is also reversibly inhibited, with similar potency, by a circulating metabolite, modafinil sulfone. Although the maximum plasma concentrations of modafinil sulfone are much lower than those of parent modafinil, the combined effect of both compounds could produce sustained partial inhibition of the enzyme. Therefore, exposure to some drugs that are substrates for CYP2C19 (e.g., phenytoin, diazepam, propranolol, omeprazole, and clomipramine) may be increased when used concomitantly with modafinil [see Drug Interactions (7)] .In a clinical study, concomitant administration of armodafinil 400 mg resulted in a 40% increase in exposure to omeprazole after a single oral dose (40 mg), as a result of moderate inhibition of CYP2C19 activity.Interactions with CNS Active Drugs Concomitant administration of modafinil with methylphenidate or dextroamphetamine produced no significant alterations on the pharmacokinetic profile of modafinil or either stimulant, even though the absorption of modafinil was delayed for approximately one hour.Concomitant modafinil or clomipramine did not alter the pharmacokinetic profile of either drug; however, one incident of increased levels of clomipramine and its active metabolite desmethylclomipramine was reported in a patient with narcolepsy during treatment with modafinil.CYP2C19 also provides an ancillary pathway for the metabolism of certain tricyclic antidepressants (e.g., clomipramine and desipramine) and selective serotonin reuptake inhibitors that are primarily metabolized by CYP2D6. In tricyclic-treated patients deficient in CYP2D6 (i.e., those who are poor metabolizers of debrisoquine; 7 % to 10% of the Caucasian population; similar or lower in other populations), the amount of metabolism by CYP2C19 may be substantially increased. Modafinil may cause elevation of the levels of the tricyclics in this subset of patients[see Drug Interactions (7)] .Concomitant administration of armodafinil with quetiapine reduced the systemic exposure of quetiapine.Interaction with P-Glycoprotein An in vitro study demonstrated that armodafinil is a substrate of P-glycoprotein. The impact of inhibition of P-glycoprotein is not known. Carcinogenesis Carcinogenicity studies were conducted in which modafinil (a mixture of R-and S-modafinil) was administered in the diet to mice for 78-weeks and to rats for 104-weeks at doses of 6 mg/kg/day, 30 mg/kg/day, and 60 mg/kg/day. The highest doses studied were associated with plasma modafinil exposures (AUC) less than that in humans at the recommended human dose (RHD) of modafinil (200 mg/day). There was no evidence of tumorigenesis associated with modafinil administration in these studies. However, the mouse study was inadequate because the high dose was not a maximum tolerated dose (MTD). In a mouse carcinogenicity study in which armodafinil (the R-enantiomer of modafinil) was administered at oral doses of up to 300 mg/kg/day in males and 100 mg/kg/day in females for approximately 2-years, no tumorigenic effects were observed. The highest doses studied, which were considered MTDs, were associated with plasma armodafinil exposures less than (females) or 2-times (males) that in humans at the RHD of modafinil. Mutagenesis Modafinil was negative in a series of in vitro (i.e., bacterial reverse mutation, mouse lymphoma tk, chromosomal aberration in human lymphocytes, cell transformation in BALB/3T3 mouse embryo cells) or in vivo (mouse bone marrow micronucleus) assays. Impairment of Fertility Oral administration of modafinil (doses of up to 480 mg/kg/day) to male and female rats prior to and throughout mating, and continuing in females through day 7 of gestation produced an increase in the time to mate at the highest dose; no effects were observed on other fertility or reproductive parameters. The no-effect dose of 240 mg/kg/day was associated with a plasma modafinil AUC less than that in humans at the RHD of modafinil. The effectiveness of modafinil in improving wakefulness in adult patients with excessive sleepiness associated with narcolepsy was established in two US 9-week, multi-center, placebo-controlled, parallel-group, double-blind studies of outpatients who met the criteria for narcolepsy. A total of 558 patients were randomized to receive modafinil 200 mg/day or 400 mg/day, or placebo. The criteria for narcolepsy include either: 1) recurrent daytime naps or lapses into sleep that occur almost daily for at least three months, plus sudden bilateral loss of postural muscle tone in association with intense emotion (cataplexy); or 2) a complaint of excessive sleepiness or sudden muscle weakness with associated features: sleep paralysis, hypnagogic hallucinations, automatic behaviors, disrupted major sleep episode; and polysomnography demonstrating one of the following: sleep latency less than 10-minutes or rapid eye movement (REM) sleep latency less than 20-minutes. For entry into these studies, all patients were required to have objectively documented excessive daytime sleepiness, via a Multiple Sleep Latency Test (MSLT) with two or more sleep onset REM periods and the absence of any other clinically significant active medical or psychiatric disorder. The MSLT, an objective polysomnographic assessment of the patient's ability to fall asleep in an unstimulating environment, measured latency (in minutes) to sleep onset averaged over 4 test sessions at 2-hour intervals. For each test session, the subject was told to lie quietly and attempt to sleep. Each test session was terminated after 20-minutes if no sleep occurred or 15-minutes after sleep onset. In both studies, the primary measures of effectiveness were: 1) sleep latency, as assessed by the Maintenance of Wakefulness Test (MWT); and 2) the change in the patient's overall disease status, as measured by the Clinical Global Impression of Change (CGI-C). For a successful trial, both measures had to show statistically significant improvement. The MWT measures latency (in minutes) to sleep onset averaged over 4 test sessions at 2-hour intervals following nocturnal polysomnography. For each test session, the subject was asked to attempt to remain awake without using extraordinary measures. Each test session was terminated after 20-minutes if no sleep occurred or 10-minutes after sleep onset. The CGI-C is a 7-point scale, centered at No Change, and ranging from Very Much Worse to Very Much Improved. Patients were rated by evaluators who had no access to any data about the patients other than a measure of their baseline severity. Evaluators were not given any specific guidance about the criteria they were to apply when rating patients. Both studies demonstrated improvement in objective and subjective measures of excessive daytime sleepiness for both the 200 mg and 400 mg doses compared to placebo. Patients treated with modafinil showed a statistically significantly enhanced ability to remain awake on the MWT at each dose compared to placebo at final visit (Table 2). A statistically significantly greater number of patients treated with modafinil at each dose showed improvement in overall clinical condition as rated by the CGI-C scale at final visit (Table 3). Nighttime sleep measured with polysomnography was not affected by the use of modafinil. The effectiveness of modafinil in improving wakefulness in patients with excessive sleepiness associated with OSA was established in two multi-center, placebo-controlled clinical studies of patients who met the criteria for OSA. The criteria include either: 1) excessive sleepiness or insomnia, plus frequent episodes of impaired breathing during sleep, and associated features such as loud snoring, morning headaches and dry mouth upon awakening; or 2) excessive sleepiness or insomnia and polysomnography demonstrating one of the following: more than five obstructive apneas, each greater than 10-seconds in duration, per hour of sleep and one or more of the following: frequent arousals from sleep associated with the apneas, bradytachycardia, and arterial oxygen desaturation in association with the apneas. In addition, for entry into these studies, all patients were required to have excessive sleepiness as demonstrated by a score ≥ 10 on the Epworth Sleepiness Scale (ESS), despite treatment with continuous positive airway pressure (CPAP). Evidence that CPAP was effective in reducing episodes of apnea/hypopnea was required along with documentation of CPAP use. In the first study, a 12-week trial, a total of 327 patients with OSA were randomized to receive modafinil 200 mg/day, modafinil 400 mg/day, or matching placebo. The majority of patients (80%) were fully compliant with CPAP, defined as CPAP use greater than 4-hours/night on > 70% of nights. The remainder were partially CPAP compliant, defined as CPAP use < 4-hours/night on > 30% of nights. CPAP use continued throughout the study. The primary measures of effectiveness were 1) sleep latency, as assessed by the Maintenance of Wakefulness Test (MWT) and 2) the change in the patient's overall disease status, as measured by the Clinical Global Impression of Change (CGI-C) at the final visit [see Clinical Studies (14.1) for a description of these measures]. Patients treated with modafinil showed a statistically significant improvement in the ability to remain awake compared to placebo-treated patients as measured by the MWT at final visit (Table 2). A statistically significant greater number of patients treated with modafinil showed improvement in overall clinical condition as rated by the CGI-C scale at final visit (Table 3). The 200 mg and 400 mg doses of modafinil produced statistically significant effects of similar magnitude on the MWT, and also on the CGI-C. In the second study, a 4-week trial, 157 patients with OSA were randomized to receive modafinil 400 mg/day or placebo. Documentation of regular CPAP use (at least 4-hours/night on 70% of nights) was required for all patients. The primary measure of effectiveness was the change from baseline on the ESS at final visit. The baseline ESS scores for the modafinil and placebo groups were 14.2 and 14.4, respectively. At week 4, the ESS was reduced by 4.6 in the modafinil group and by 2 in the placebo group, a difference that was statistically significant. Nighttime sleep measured with polysomnography was not affected by the use of modafinil. Store at 20°C to 25°C (68°F to 77° F). [See USP Controlled Room Temperature].Dispense in a tight container. Advise the patient to read the FDA-approved patient labeling (Medication Guide). Allergic ReactionsAdvise patients to stop taking modafinil and to notify their physician right away if they develop a rash, hives, mouth sores, blisters, peeling skin, trouble swallowing or breathing, or a related allergic phenomenon. Driving and Dangerous ActivitiesAdvise patients not to alter their previous behavior with regard to potentially dangerous activities (e.g., driving, operating machinery) or other activities requiring appropriate levels of wakefulness, until and unless treatment with modafinil has been shown to produce levels of wakefulness that permit such activities. Advise patients that modafinil is not a replacement for sleep. Continuing Previously Prescribed TreatmentsInform patients that it may be critical that they continue to take their previously prescribed treatments (e.g., patients with OSA receiving CPAP should continue to do so). Discontinuing Drug Due to Adverse ReactionsAdvise patients to stop taking modafinil and contact their physician right away if they experience chest pain, rash, depression, anxiety, or signs of psychosis or mania.PregnancyAdvise patients to notify their physician if they become pregnant or intend to become pregnant during therapy. Caution patients regarding the potential increased risk of pregnancy when using steroidal contraceptives (including depot or implantable contraceptives) with modafinil and for one month after discontinuation of therapy. NursingAdvise patients to notify their physician if they are breastfeeding an infant. Concomitant MedicationAdvise patients to inform their physician if they are taking, or plan to take, any prescription or over-the-counter drugs, because of the potential for interactions between modafinil and other drugs. Alcohol Advise patients that the use of modafinil in combination with alcohol has not been studied. Advise patients that it is prudent to avoid alcohol while taking modafinil. 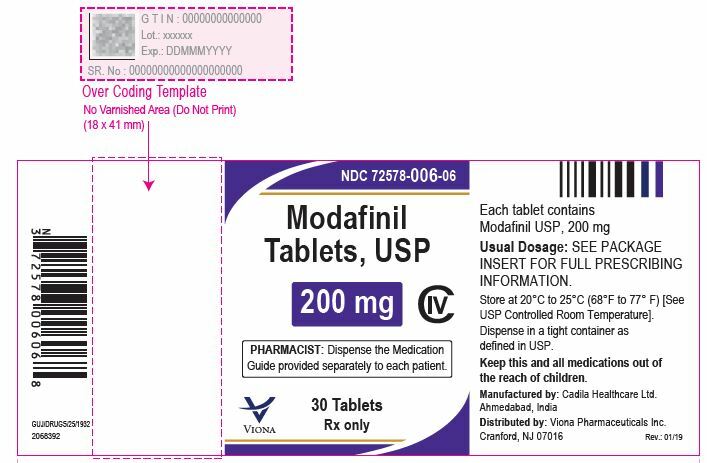 MEDICATION GUIDEModafinil (moe daf' i nil) Tablets, USP C-IVRead this Medication Guide before you start taking modafinil tablets and each time you get a refill. There may be new information. This information does not take the place of talking with your doctor about your medical condition or treatment. What is the most important information I should know about Modafinil tablets? Modafinil tablets may cause serious side effects including a serious rash or a serious allergic reaction that may affect parts of your body such as your liver or blood cells. Any of these may need to be treated in a hospital and may be life-threatening. Stop taking modafinil tablets and call your doctor right away or get emergency help if you have any of these symptoms: skin rash, hives, sores in your mouth, or your skin blisters and peelsswelling of your face, eyes, lips, tongue, or throattrouble swallowing or breathingfever, shortness of breath, swelling of the legs, yellowing of the skin or whites of the eyes, or dark urine.If you have a severe rash with modafinil, stopping the medicine may not keep the rash from becoming life-threatening or causing you to be permanently disabled or disfigured. Modafinil tablets are not approved for use in children for any medical condition. It is not known if modafinil tablets are safe or effective in children under 17-years of age. What are Modafinil tablets? Modafinil tablets are a prescription medicine used to improve wakefulness in adults who are very sleepy due to one of the following diagnosed sleep disorders: narcolepsyobstructive sleep apnea (OSA). Modafinil tablets are used to treat excessive sleepiness, but not the obstruction or medical condition that is causing OSA. You should talk with your doctor about treatments for OSA before you start taking modafinil tablets and during treatment with modafinil. Modafinil tablets do not take the place of treatments that your doctor has prescribed for OSA. It is important that you continue to use these treatments as prescribed by your doctor.shift work disorder (SWD)Modafinil tablets will not cure these sleep disorders. Modafinil tablets may help the sleepiness caused by these conditions, but it may not stop all your sleepiness. Modafinil tablets do not take the place of getting enough sleep. Follow your doctor's advice about good sleep habits and using other treatments. Modafinil tablets are a federally controlled substance (C-IV) because it can be abused or lead to dependence. Keep modafinil tablets in a safe place to prevent misuse and abuse. Selling or giving away modafinil tablets may harm others, and is against the law. Tell your doctor if you have ever abused or been dependent on alcohol, prescription medicines, or street drugs.Who should not take Modafinil tablets?Do not take modafinil tablets if you: are allergic or developed a rash to modafinil or armodafinil (NUVIGIL®) or any of the ingredients in modafinil tablets. See the end of this Medication Guide for a complete list of ingredients in modafinil tablets.What should I tell my doctor before taking Modafinil tablets?Tell your doctor about all of your medical conditions including, if you: have a history of mental health problems, including psychosishave heart problems or had a heart attackhave high blood pressure. Your blood pressure may need to be checked more often while taking modafinil tablets.have liver or kidney problemshave a history of drug or alcohol abuse or addictionare pregnant or planning to become pregnant. It is not known if modafinil will harm your unborn baby.Pregnancy Registry: There is a registry for women who become pregnant during treatment with modafinil tablets. The purpose of this registry is to collect information about the safety of modafinil tablets during pregnancy. Contact the registry as soon as you learn that you are pregnant, or ask your doctor to contact the registry for you. You or your doctor can get information and enroll you in the registry by calling 1-866-404-4106. are breastfeeding. It is not known if modafinil passes into your breast milk. Talk to your doctor about the best way to feed your baby if you take modafinil tablets.Tell your doctor about all the medicines you take, including prescription and over-the-counter medicines, vitamins, and herbal supplements. Modafinil and many other medicines can interact with each other, sometimes causing side effects. Modafinil may affect the way other medicines work, and other medicines may affect how modafinil works. Your dose of modafinil or certain other medicines may need to be changed. Especially, tell your doctor if you use or take: a hormonal birth control method, such as birth control pills, shots, implants, patches, vaginal rings, and intrauterine devices (IUDs). Hormonal birth control methods may not work while you take modafinil. Women who use one of these methods of birth control may have a higher chance for getting pregnant while taking modafinil, and for one month after stopping modafinil. Talk to your doctor about birth control choices that are right for you while taking modafinil.Know the medicines you take. Keep a list of them and show it to your doctor and pharmacist when you get a new medicine. Your doctor or pharmacist will tell you if it is safe to take modafinil and other medicines together. Do not start any new medicines with modafinil unless your doctor has told you it is okay. How should I take Modafinil tablets? Take modafinil tablets exactly as prescribed by your doctor. Your doctor will prescribe the dose of modafinil tablets that is right for you. Do not change your dose of modafinil tablets without talking to your doctor.Your doctor will tell you the right time of day to take modafinil tablets.People with narcolepsy or OSA usually take modafinil tablets 1-time each day in the morning.People with SWD usually take modafinil tablets about 1-hour before their work shift.Do not change the time of day you take modafinil tablets unless you have talked to your doctor. If you take modafinil tablets too close to your bedtime, you may find it harder to go to sleep.You can take modafinil tablets with or without food.If you take more than your prescribed dose or if you take an overdose of modafinil tablets, call your doctor or go to the nearest hospital emergency room right away.Symptoms of an overdose of modafinil tablets may include:trouble sleepingrestlessnessconfusionfeeling disorientedfeeling excitedhearing, seeing, feeling, or sensing things that are not really there (hallucinations)nausea and diarrheaa fast or slow heartbeatchest painincreased blood pressureWhat should I avoid while taking Modafinil tablets? Do not drive a car or do other dangerous activities until you know how modafinil affects you. People with sleep disorders should always be careful about doing things that could be dangerous. Do not change your daily habits until your doctor tells you it is okay.You should avoid drinking alcohol. It is not known how drinking alcohol will affect you when taking modafinil tablets.What are possible side effects of Modafinil tablets?Modafinil tablets may cause serious side effects. Stop taking modafinil tablets and call your doctor right away or get emergency help if you get any of the following: a serious rash or serious allergic reaction. (See "What is the most important information I should know about Modafinil tablets? ")mental (psychiatric) symptoms, including: depressionfeeling anxioushearing, seeing, feeling, or sensing things that are not really there (hallucinations)an extreme increase in activity and talking (mania)thoughts of suicideaggressive behaviorother mental problemssymptoms of a heart problem, including chest pain, abnormal heartbeat, and trouble breathing.Common side effects that can happen in anyone who takes modafinil tablets include:headacheback painnauseafeeling nervousstuffy nosediarrheafeeling anxioustrouble sleepingdizzinessupset stomachModafinil tablets are not approved for use in children for any medical condition including Attention Deficit Hyperactivity Disorder (ADHD). In studies of modafinil tablets in children with narcolepsy, side effects included: Tourette's syndromehostile behaviorincrease in sudden loss of muscle tone and severe muscle weaknessincrease in seeing and hearing things when falling asleepincrease in suicidal thoughtslow white blood countpainful menstrual periodsTell your doctor if you get any side effect that bothers you or that does not go away while taking modafinil tablets. These are not all the side effects of modafinil tablets. For more information, ask your doctor or pharmacist. Some effects of modafinil tablets on the brain are the same as other medicines called "stimulants". These effects may lead to abuse or dependence on modafinil tablets. Call your doctor for medical advice about side effects. You may report side effects to Viona Pharmaceuticals Inc. at 1-888-304-5011 or FDA at 1-800-FDA-1088.How should I store Modafinil tablets? Store modafinil at room temperature between 68° F and 77° F (20°C and 25° C).Keep modafinil tablets and all medicines out of the reach of children. General information about the safe and effective use of Modafinil tablets.Medicines are sometimes prescribed for purposes other than those listed in a Medication Guide. Do not use modafinil tablets for a condition for which it was not prescribed. Do not give modafinil tablets to other people, even if they have the same symptoms you have. It may harm them and it is against the law. This Medication Guide summarizes the most important information about modafinil tablets. If you would like more information, talk with your doctor. You can ask your doctor or pharmacist for information about modafinil tablets that is written for health professionals. What are the ingredients in Modafinil tablets?Active Ingredient: modafinil, USPInactive Ingredients: croscarmellose sodium, lactose monohydrate, magnesium stearate, microcrystalline cellulose, povidone, and pregelatinized starch.This Medication Guide has been approved by the U.S. Food and Drug Administration.